Formed in 1989, CD has 25 years’ experience of remarketing and managing vehicles for many of the UK’s leading organisations. With clients from the rental and leasing sector as well as large and small corporations our success in online remarketing of used vehicles has enabled us to develop long term relationships with both our clients and buyers. For clients that want us to manage the complete defleet cycle, we operate from a purpose built three acre site in Corby, where we can provide a complete vehicle logistics service, on site bodyshop and valeting facilities. Our high quality photo booth ensures clear and detailed appraisal pictures of every vehicle we sell. 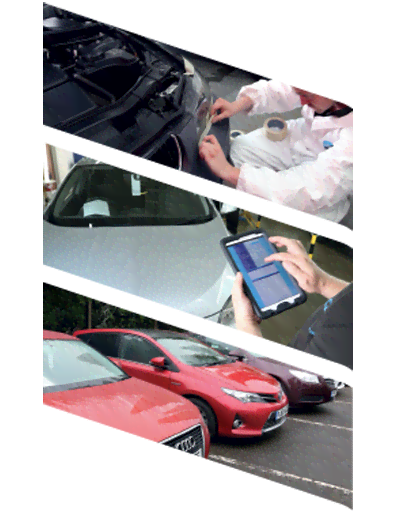 Our on-site bodyshop facility enables us to offer speedy and cost effective repairs to vehicles before sale. Establish CD Fleet Services to reflect the business services offered to large fleet operators. Launches responsive website site allowing buyers to bid via smart phone and tablet. Establish CD Commercial Centre in Corby, allowing commercial vehicles being remarketed to be handled in their own surroundings. Acquired by Arctos Holdings Ltd, owners of SMH Fleet Solutions Ltd and Hudson Kapel Ltd. The business is focused on remarketing and management of vehicles from the trade to the trade. All our sales are on-line rather than a physical auction, ensuring we reach a much broader range of buyers. We offer large clients branded sales with general fleet and commercial sales held at regular dates and days of the week, ensuring buyers are in the habit of viewing our auctions. We have also established remote auctions for clients that have the facilities to hand vehicles over to buyers once the remarketing process is complete. This remote process does not detract from our high quality vehicle images and appraisals but helps vendors by keeping logistics costs to a minimum. Our in-house vehicle logistics division offers a full collection and delivery service throughout the UK, Ireland and mainland Europe. Experts in delivering high value, premium brand vehicles our professional uniformed drivers have a well-established reputation for care, quality-control and reliability.